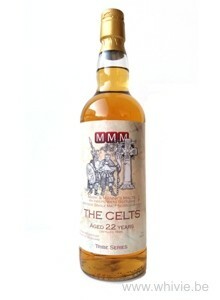 For our second single cask release in the Tribe Series, Jurgen Robyns designed another great label: the fierce Celts. And as with the Picts, our prevous release, it is again a secret Speyside scotch, from a distillery that was founded in 1892 in the valley of the dear, literally a stone’s throw away from the famous distillery that produced our Picts. Nuff said! It matured on a bourbon cask for 22 long years. And it is simply marvelous, thank you very much. Soft and very fruity nose on apple, pear and mandarin, with a hint of pink grapefruit, upholstered with pineapple and juicy apricots. Turkish Delight, honey, liquorice and rosewater. Hint of Graeffe sugar (light brown sugar that goes on pancakes). Delicious. It is oily and silky soft on the palate. Immediately a lovely spicy note appears from white pepper, ginger and liquorice. The fruit of the nose returns in full regalia. The wonderfully long and sweet finish gives me a warm glow inside. Heartwarming. I’m almost reluctant to admit, but this one is even slightly better than the Picts and that was a great one already. They sure know what they are doing in Dufftown.